A black and white negative of Helen Anderson holding her daughter Roberta on her lap. In this view Helen is smiling and looking down at Roberta. Roberta is smiling at the photographer. 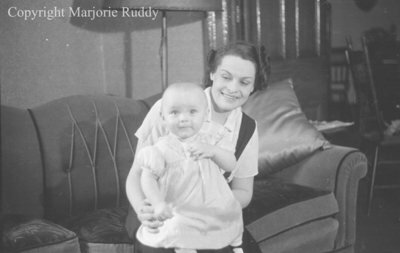 Helen & Roberta Anderson, April 22, 1938, Marjorie Ruddy. Whitby Archives, A2013_040_873D.